My beginnings as a cabinetmaker started when I attended the first class of The College of the Redwoods in Fort Bragg, California, studing under James Krenov and graduating in 1982. Sherrie and I started Signature Gallery in 1987 as a retail store offering a collection of handmade items, signed by the artist. We have since moved on to our current cabinet shop location where we make our furniture. In our small showroom, you can see completed pieces or projects in the works. We are a small business with 3 of us working in the shop, and it is here we can meet to discuss your ideas and designs, choose your woods and colors from our samples, as well as setting up an appointment in your home. Our clients are comprised of repeat business and referrals due to our expertise, punctuality, and giving our clients more than they expect. We are enthusiastic about extending our reach through our website where you will find a sampling of photos of our work, and look forward to continuing to serve our loyal clients, as well as sharing our craft with new clients. We deliver in our own truck within a 75 mile radius of Philadelphia, Pennsylvania. Shipping can be done within the United States by common carrier, blanket wrapped by furniture moving specialists, charged by weight and destination. We are pleased to accept Visa & Master Card. We are a full service cabinet shop in that we build, finish, and install with our own in-house crew. 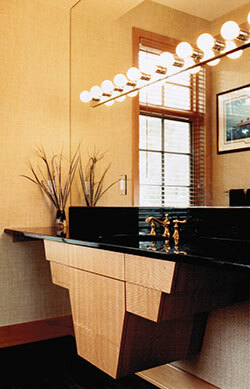 We keep a wide variety of wood species on hand, including solid woods and exotic veneers. We are adept at design for audio video cabinetry and libraries, and regularly incorporate electronic components into our work, whether they be TV lifts, projector lifts, or electronic doors. Our finishing is a multi-step process that results in the most beautiful feel and look. We look forward to any inquiries about our work and excellent craftsmanship.